MCSaite Ultra Slim Number Keyboard and Mouse Combo is the latest improved version. It adopts fashionable design and smooth figure, making you feel good. Butterfly structure keys with soft-touch enables more comfortable typing experience. Delicate appearance, comfortable hand feeling, reliable connection, give you best usage experience. Auto Sleep: No power button required, automatically enter the hibernation mode. 1000 DPI optical precision switchable. 3 level power saving mode. Warm prompt: One Year Warranty. Any question during use, please feel free to contact us. 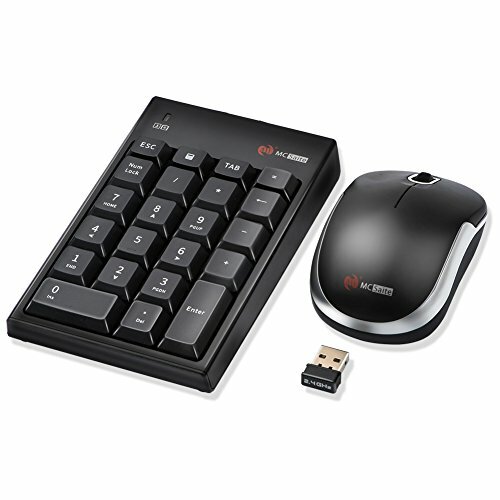 Plug & Play - Comes with a tiny USB Nano receiver(stored within the back of the mouse) , just plug it into your PC and then can use Numeric Keypad and Mouse.Built-in mini receiver and dustproof. Comfortable Keys - Big, full size, soft concave 22 button to improve efficiency，Convenient and quick design, perfect match your work. Ergonomic Mice - Tilt Angle design gives you comfortable experience，1200 dpi optical sensor: Move your mouse with accuracy and speed.